How do I use the Allocations Report? 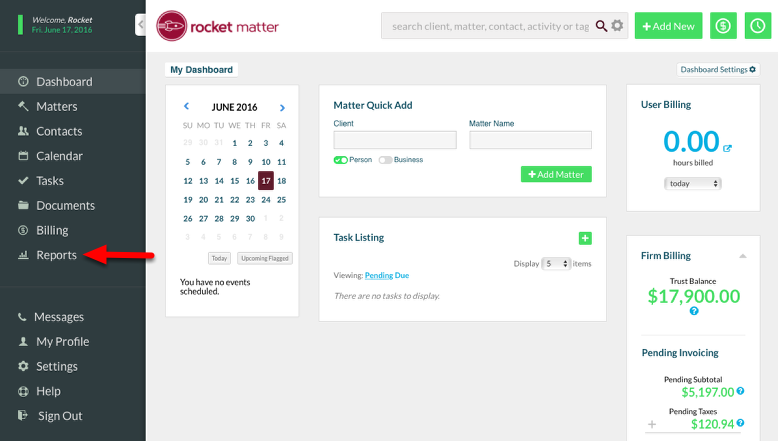 The Allocation Report is part of Rocket Matter's Advanced Analytics Module. The Allocations report shows the amount of client payments your attorneys bring in. 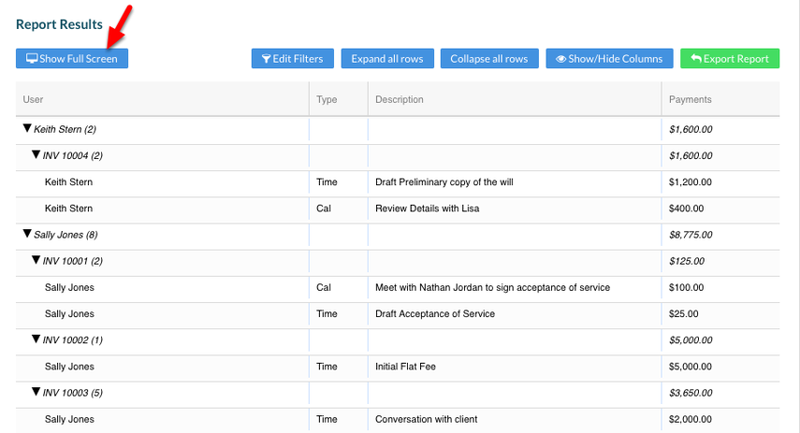 This makes it easy to calculate payouts, and supports payroll structures that pay attorneys a percentage of revenues. Allocation Report details include User, Type, Description, Payment. 2. 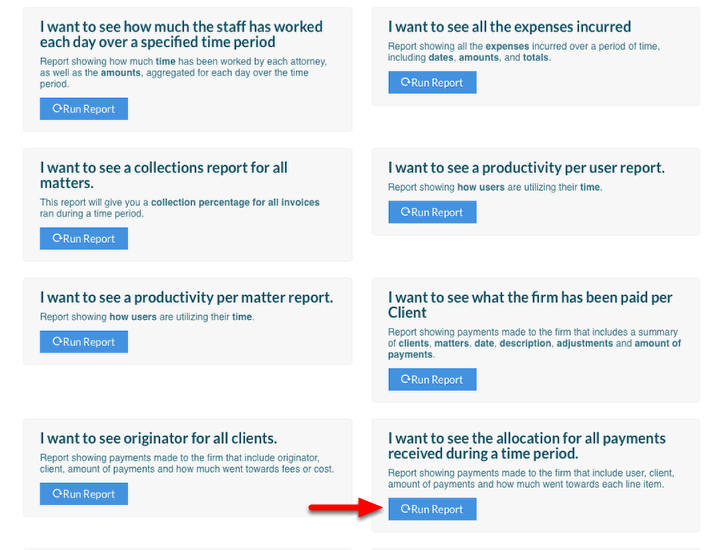 Scroll down to "I want to see the allocation for all payments received during a time period", and select "Run Reports". The Allocation Report has preset default filters applied which yield the initial results displayed. You can edit your filters to display different results. A. Click "Expand all rows" to view complete information. B. Click "Edit Filters" to change report criteria. C. Modify filter criteria. Then click "Get Answer". 4. Change display options as needed. A. Click "Expand all rows" or "Collapse all rows" to expand/collapse data. B. Select "Show/Hide" Columns to change column display. 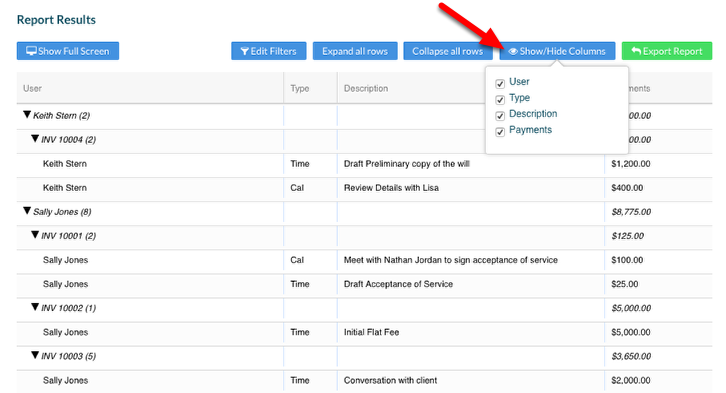 C. "Show Full Screen" will expand your report to full screen visibility. Zoom: C. &quot;Show Full Screen&quot; will expand your report to full screen visibility. 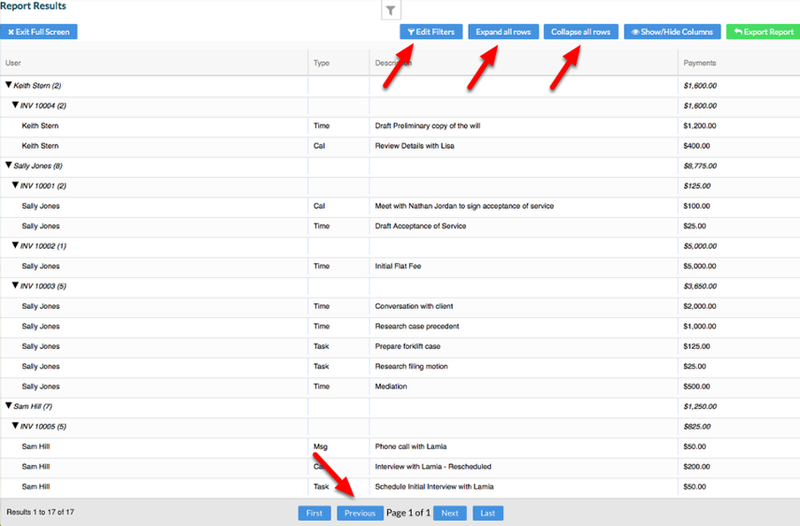 D. Select filter, viewing options, and pagination buttons to customize full screen view. Zoom: D. Select filter, viewing options, and pagination buttons to customize full screen view. 5. 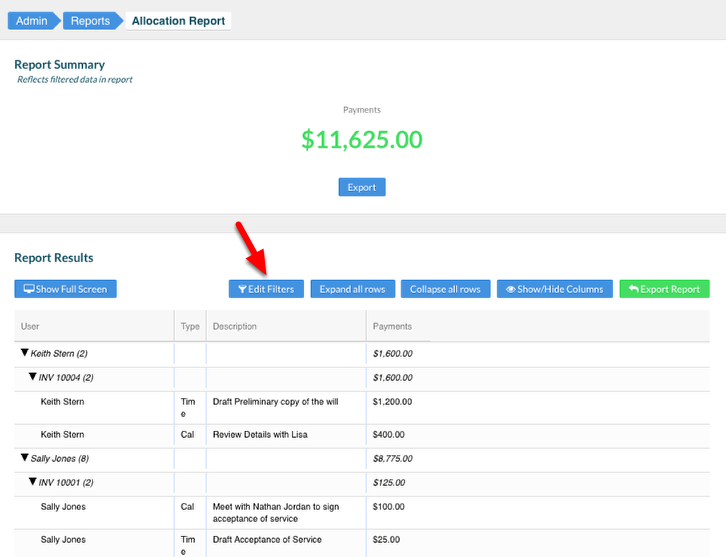 Report Summary displays Total Payments for date range specified. Zoom: 5. 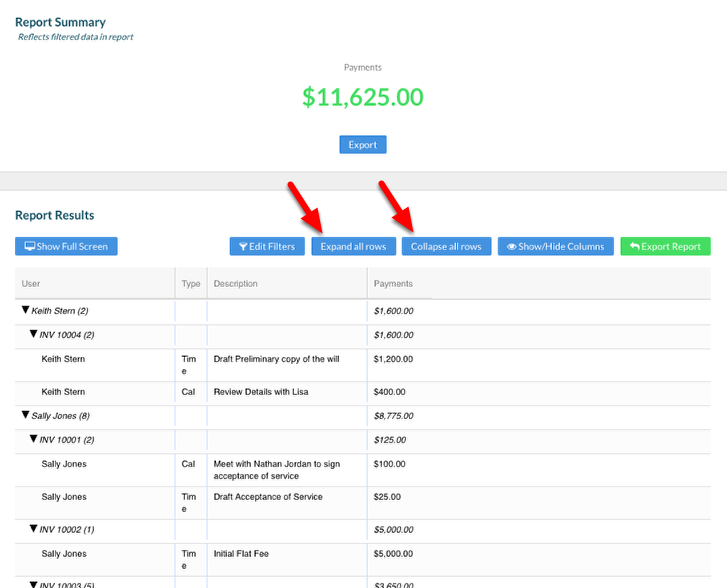 Report Summary displays Total Payments for date range specified. 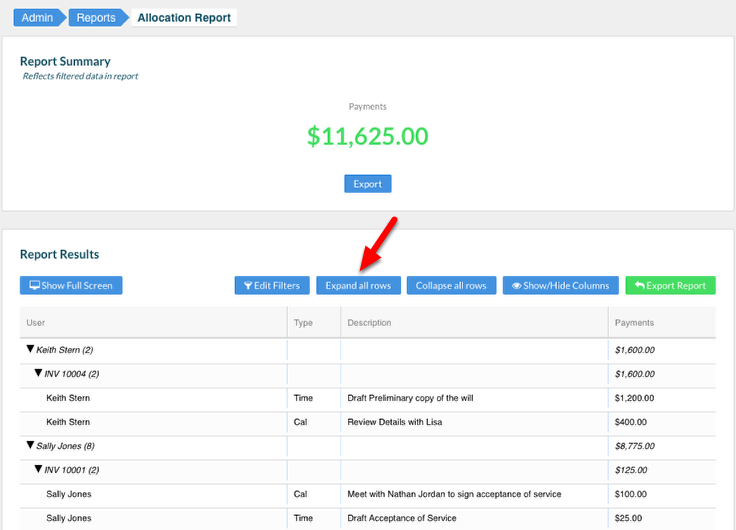 Allocation Report results can be exported in .csv format by selecting the "Export" button. Prev: Collections Report: Why does 'None' appear as the User in my report?